In 1897, at a meeting of the Society of Russian Physicians, Ivan Pavlov predicted that the last stage of the life sciences would be the physiology of the living molecule. Nowadays the last stages of molecular approaches are theoretical quantum-chemical calculational techniques and experimental patch-clamp method which really can describe the behavior of living molecules. 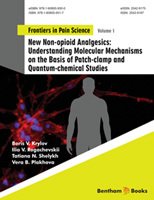 An attempt of combined application of quantum-chemical calculations and the patch-clamp method to investigation of the nociceptive system is presented in this volume. The crosstalk between drug substances and membrane receptors is conducted in the language of molecules. The behavior of single molecules upon their ligand-receptor binding should be investigated at physiologically adequate conditions during development of new analgesics. The requirement of physiological adequacy was always taken into account when the authors tried to explain the background mechanisms governing the effects of powerful analgesics. This approach makes it possible to elucidate how the chemical structure of labile attacking molecules should be finely tuned to provide effective binding to their membrane receptor. The authors hope that this review will open a new perspective to application of molecular methods in the drug design of pain relievers. The urgent need for the development of novel analgesics is dictated by the lack of safe and effective drugs in this field of medicine, especially when the pain becomes intolerable and incurable. The arsenal of practical medicine includes an array of analgesics, which have to be applied basing on the severity of pathological conditions of the organism. Step 1 of the World Health Organization analgesic ladder consists of non-opioids, administered with or without adjuvants depending on the type of pain. Step 2 comprises step 1 agents plus opioids which can relieve mild to moderate pain. Step 3 involves step 2 agents with addition of opioids for moderate to severe pain relief. It is a matter of common knowledge that administration of opioid substances results in irreversible adverse side effects in humans. The major objective of the authors is to solve this underlying problem by creating novel analgesics which could replace opioids in clinical practice, while remaining completely safe. This book presents our main result in elucidation of the physiological role of a novel membrane signaling pathway involving the opioid-like receptor coupled to slow sodium channels (Nav1.8) via Na+,K+-ATPase as the signal transducer. This pathway is distinct from and additional to the known mechanism of the opioidergic system functioning that involves G proteins. Activation of the opioid-like receptor further triggering the signaling pathway directed towards Nav1.8 channels provides the effectiveness and safety of our novel analgesic which is potent enough to relieve severe pain otherwise relieved exclusively by Step 3 opioids. It is nowadays almost inevitable for reviewers of scientific material in the field of nociception to make excuses for omissions. We are sincerely sorry for not having been able to discuss all the findings in physiology of nociception and in practical medicine that would have merited attention. To include all would have defeated the purpose of this volume by making it grow out of all proportions. This book presents an informative and valuable for physiologists and clinicians overview of primary molecular mechanisms involved in functioning of the peripheral nociceptive system. This material can be used in courses given to students specializing in physiology, psychology, and medicine, as well as to physicians training in neurology, neurosurgery, and psychiatry. The principles presented in the current volume may also be of interest to molecular biologists engaged in the drug design.